A guide containing recommended apps for research, ebook reading, and document storage, sharing, annotating and citing. Ebook Central is the library's collection of over 370,000 academic book titles. These books can be read on a computer or on a reading device. Below are steps to download a book to most devices. For more specific information, or if you have trouble with the steps below, check Proquest support or contact me. Make sure you have downloaded the BlueFire app to your device. Bluefire is what you will use to read the book. Go to the Info button on the Bluefire app and authorize the app with your Adobe account. If you don't have an Adobe account, go here to create one. Go to Ebrary and and sign in at the upper right hand side of the screen . You will be prompted for your A number and password. 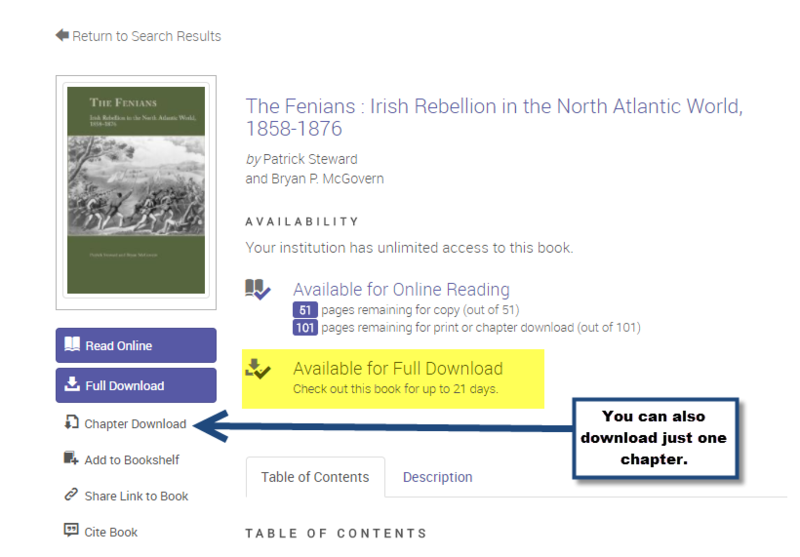 Do a search for a book and choose "full download" or "chapter download." It will walk you through the steps to download the book. See the screenshots below. Bluefire Reader should open and download the book, then giving you the option to read the book immediately or read it later. Go to the Library page on the Bluefire app to see the books you have downloaded. Clicking on the arrow to the right of the title will bring you to the status page to tell you how long it will be available to read on your iPad or other device. You can return the book early on the status page as well. Some books have a limit on how many people can download them at one time. The "Get Books" icon at the bottom of the Bluefire reader will not bring you directly to any MCLA library books, only book sellers. Authorize Bluefire Reader with Adobe account information. Search for a books and click on the download button. Choose which kind of device you are using. Ebook Central will prompt you to download BlueFire Reader. If you have already done this, choose "done with this step"
In step 3, choose Download Your Book. Downloading can take a while depending on the size of the book. You will get a message when it is done downloading. The book can now be read in BlueFire Reader. To see how long you have the book on your device, choose the info link.